Have you ever wondered what it’s like for teens to be a mom? As Christians we are supposed to be pro-life, right? But what happens when one of your friends or someone you know/have heard of becomes pregnant? Of course you want her to keep the baby! However, being pro-life isn’t enough, but it’s confusing to know how to handle the situation as a friend. A few weeks ago I was interviewed by a dynamic young woman named Lily Garay about my book Teen Mom and about teen pregnancy in general. Lily is a young woman herself, and she has friends who have faced teen pregnancy. I loved the conversation with Lily because she was passionate about reaching out to other young women. Lily asked lots of questions because she wanted to help those around her. As we talked, I took Lily first hand into my life, telling her what it was like to be a teen mom. I also answered questions on how women can help and be loving, not judging. Lily: Tricia, we want to know becoming a teen parent affected your life (both in youth and now as an adult). Tricia: I was a cheerleader and an honor roll student so on the outside I looked like a good kid. I first became pregnant at 15 and had an abortion because I didn’t want anyone to find out, but at during my senior year of high school (at 17) I found I was pregnant again by the same boyfriend that got me pregnant at 15 and this time I knew I didn’t want an abortion. When I told him I was pregnant and keeping the baby, he broke up with me and started dating someone else. I was so embarrassed and ashamed by everything that I dropped out of public high school and finished at home since I only had a couple of credits left anyways. From staying at home all the time and not having a boyfriend, my life truly changed overnight and it was really depressing. During that time that my mom and grandma’s Bible study group invited me in to their Bible study where they showed me that they loved me and were going to be there to support me. They even threw me a baby shower! God showed me that those women love me and I started thinking that maybe He does too. I grew up in church, but because of the love shown to me through these ladies, I dedicated my life to God again. I was 6 months pregnant and that was a huge turning point for me. My life again completely turned around from being depressed to now having hope, feeling like I could do college, and praying for my future husband. I decided to walk on stage for my high school graduation and three weeks later I had my first son, Corey. I started realizing that I needed to use my story to help other people so I started a teen mom support group. God showed me that – the thing I tried to hide is the thing I can use to help other people. Lily: Your new book contains lots of great information not only for teen moms, but anyone who wants to help teen parents, adult parents, and teens who would like to become parents. What would you say is your overall best piece of advice? My book is divided to the needs of teen moms, but overall the final chapter is what I want people to walk away with and that is hope in Christ. It doesn’t matter what you face – teen mom, cancer, etc. – Christ can be your strength. Lily: If you could only spend thirty seconds with a girl who was unsure if she could carry her baby to term, what would you tell her? Right now in this moment you may feel a lot of fear, but 5 or 10 years from now you are going be able to look at that child and see how God has shown up to help you and support you. No matter what happens or who leaves, God will never leave you. What about you? 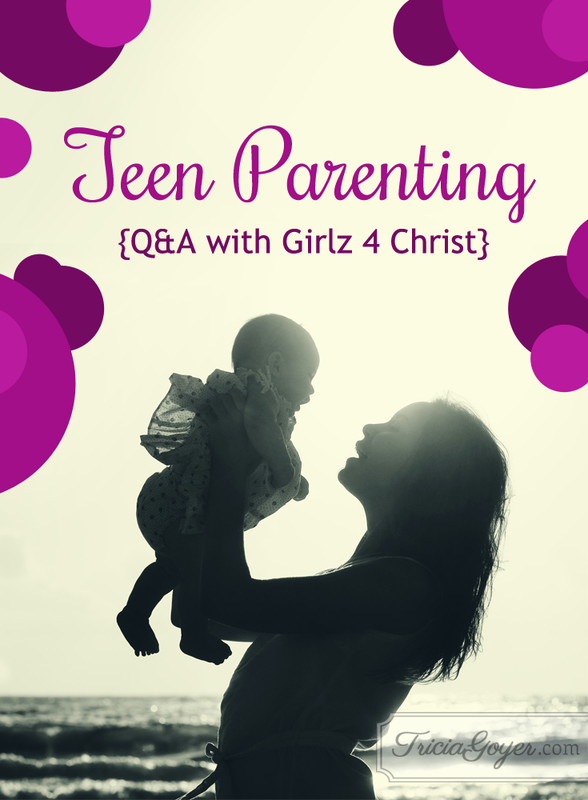 Do you have any questions about how to help a teen mom? Leave them in the comments! I’d love to answer them on a future blog post. I think this was one of the most meaningful interviews we’ve ever done. I’m the editor of Girlz 4 Christ, and I was so disappointed when my work schedule changed and I was unable to speak with you, Tricia! (But I think Lily did rock it!) I donated one of your books to a local homeless shelter for teen moms that I used to work at. Thanks for your awesome ministry and for getting involved in Girlz 4 Christ! Thank you so much! I enjoyed it, too!